In my attempted efforts to find something ornery and contemptuous about Audiotex’s Stereo and Monophonic Audiotester, I discovered that this rather expensive audio testing tool ($38.69 today, or the ridiculous price of the new Daft Punk album) is a visual work of late 1950s design/graphic art. Inception was big in the late 50s, early 60s. 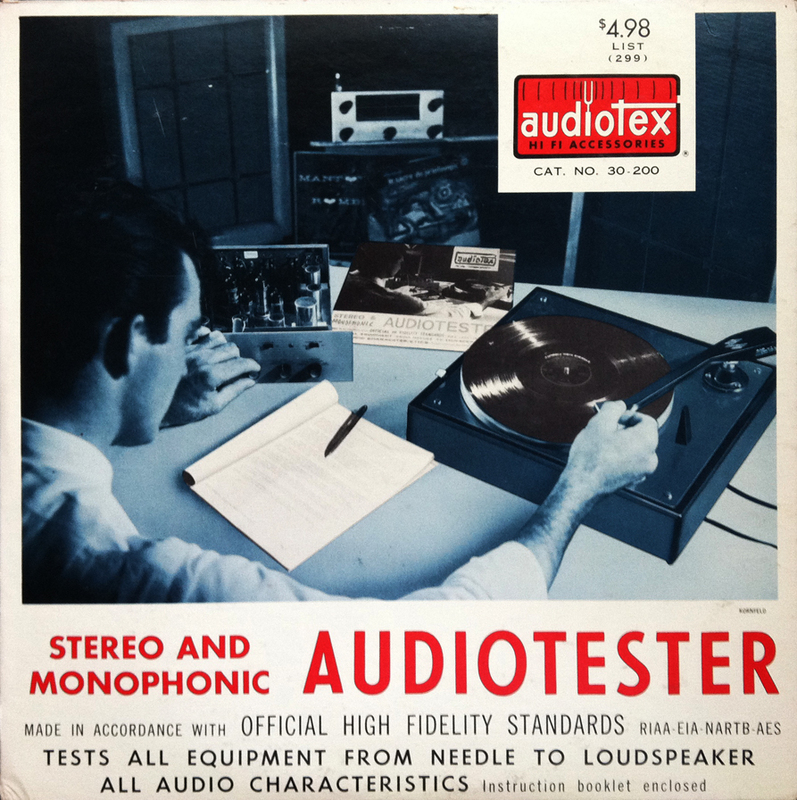 Hard at work in his audio laboratory, the technician on the cover is skillfully testing his own copy of Audiotex’s Stereo and Monophonic Audiotester. Do tests need testing? Anyway, I absolutely adore the layout of this album. The white/red/saturated blue cover (that was obviously pieced together like a picture of Lee Harvey Oswald holding a rifle on the cover of Life magazine), and the tuning fork and sound wave influenced Audiotex logo are just a few marvels found within this front sleeve. The back to this riveting test record is just as visually absorbing. 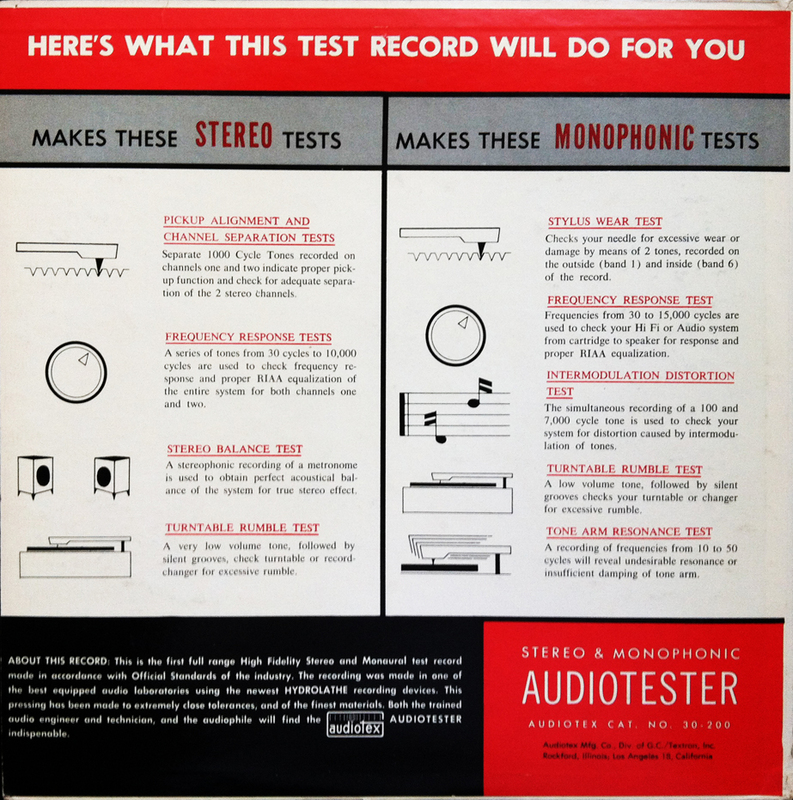 Breaking down the necessary tests for both stereophonic and monaural phonographs with overly simplified, 1959 phonographics (I just made that up), the bullet-pointed basics offered from this record are presented in an easy to understand, and visually engaging layout. From the turntable rumble test (stereo) to the tone arm resonance test (mono), this audiophile worthy test record is essential for even the novice record collector. As you can see, I’m a sucker for nostalgia that I had absolutely no part of. For me, the red/black/white color palette is always a favorite, and it’s always a treat to discover phonographic-heavy, and time-capsule-like records. Where do you get this stuff? LOVE IT! You’re just something else. Glad your tight with CCR! !